JERUSALEM -- Former Israeli President Shimon Peres' condition was showing slight improvements after he suffered a major stroke, with his physicians saying Wednesday that he had regained consciousness and squeezed his doctor's hand, while the nation rallied in prayer and support for the 93-year-old elder statesman and Nobel Peace Prize laureate. Dr. Yitzhak Kreiss, director of the Sheba Medical Center near Tel Aviv, said Peres' condition remained serious Wednesday afternoon, 24 hours after the stroke. But he said Peres' neurological signs were improving. 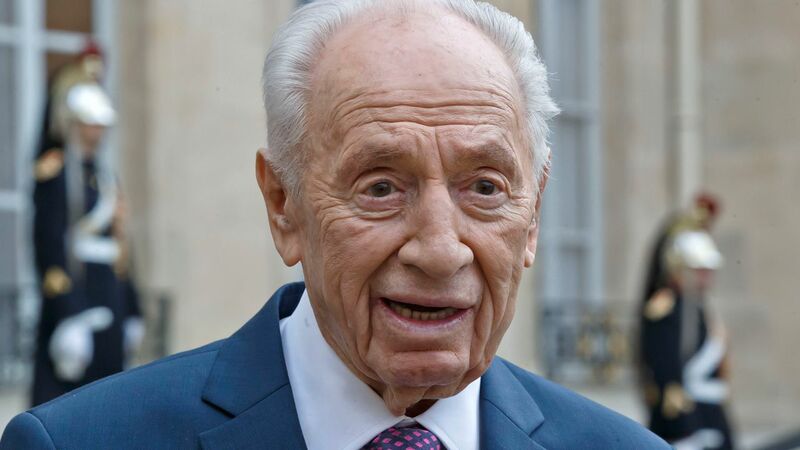 He said that Peres, who had been placed in and out of a medically induced coma, was regaining consciousness from time to time and reacting to stimulation. Peres remained on mild sedatives and a respirator, Kreiss said. "He is slightly more aware," he told reporters. "We are trying to reduce some of the sedation in order to evaluate him, and that's a good sign." Rafi Walden, Peres' son-in-law and personal physician, told the crowd that Peres had "responded well" when the dosage of medication was reduced. "I am pleased to say that he understands what is being said to him, is responsive, and even warmly squeezed my hand. We are impressed by the way the state of his recognition has improved considerably in the last few hours," Walden said. Earlier Wednesday, Walden said there appeared to be no imminent threat to his life anymore. The question was what kind of damage was sustained and what kind of recovery he could make, Walden said. In a phone briefing with reporters, Walden said earlier that Peres suffered a stroke in the right side of the brain and was being ventilated and sedated. However, he gave an optimistic forecast, saying all Peres' physical parameters were stable and his blood tests were good. Peres is the elder statesman of Israeli politics, one of the country's most admired symbols and the last surviving link to its founding fathers. Over a seven-decade career, he's held virtually every senior political office, including three stints as prime minister and extended terms as foreign, defense and finance minister. He won the 1994 Nobel Peace Prize for his work in reaching an interim peace agreement with the Palestinians. He had remained active since completing his seven-year term as president in 2014, refusing to bow into retirement. His spokeswoman Ayelet Frisch said Tuesday was no exception, with Peres waking early to read the daily newspapers before delivering an hour-long lecture and then uploading a video to his Facebook account in which he encouraged the public to buy locally made products. In the video, he appears weary but is otherwise alert and coherent. Peres is known to keep a healthy lifestyle and has long prided himself in his longevity and stamina. Earlier this year, Peres was twice hospitalized for heart problems but quickly discharged. His office said Peres received a pacemaker last week. Long a divisive figure in Israeli politics, Peres finally became one of Israel's most popular public figures in his later years. "In his people's eyes he ceased to be a politician. He became an historic figure, larger than politics, larger than everyday affairs, a figure in a league of his own," wrote Nahum Barnea, a columnist for the Israeli daily, Yediot Ahronot. As word of his stroke spread, Peres was showered with well wishes from political friends and foes alike. Prime Minister Benjamin Netanyahu, who defeated Peres in 1996 to become prime minister, personally called the hospital to enquire on Peres' condition and posted a Facebook message wishing him a speedy recovery. In a visit late Wednesday to the hospital, Netanyahu said, "I think I speak for all the people of Israel and many who are outside of Israel. Tonight we feel a certain relief." The chief rabbis of Israel have called on the public to pray for Peres' recovery. His son, Hemi Peres, said the family has been overwhelmed with the love and affection it has received from Israel and around the world. But he warned that it was far too soon to eulogize his tenacious father. "We are still in a battle and it is the beginning of the battle," he told Israel's Army Radio.